The remarkable history of Clingmans Dome is captured and reveals the gem that stands prominently in Great Smoky Mountains National Park. Secret, untold and unique stories unravel through the intriguing details that go beyond the iconic spiral observation deck to include the adjoining areas so intrinsically linked in Clingmans Dome Revealed. Sacred to the Cherokee, logged by entrepreneurs and preserved by visionaries, the highest peak in the Smoky Mountains has a diverse and varied history. A background intermingled with discovery, war, spirituality, tragedy, inspiration and natural beauty, Clingmans Dome stands sentinel over Great Smoky Mountains National Park. Secret, untold and unique stories unravel through the intriguing details that go beyond the iconic spiral observation deck to include the adjoining areas so intrinsically linked. Illustrated with photographs and presented in a straight forward and easy to read format, the fascinating insight provides a unique perspective into this distinctive peak and the surrounding slopes. In the shadows of Clingmans Dome, a great national park evolved, the idea for the Wilderness Society was kindled, Cherokee hid to avoid the Trail of Tears, a two thousand mile hiking trail crests no higher and a postage stamp featured the magnificent artwork supplied by the setting sun. Rising above the Southern Appalachians to an elevation of 6,643 feet, the early history of the summit was influenced by Native Americans and European Explorers, the landscape modernized by the Civilian Conservation Corps and Mission 66, and the natural beauty is currently under attack by a nearly microscopic intruder. Known to the Cherokee as Kuwahi and the early European settlers as Smoky Dome, the story of what is now the most accessible peak in the Smoky Mountains is captured. The remarkable history of Clingmans Dome is revealed highlighting the fascinating natural, historical and cultural gem that stands prominently over the Smoky Mountains. A comprehensive collection of historical morsels, unique facts and present day tidbits are molded into a unique perspective of the spiral-capped summit. Clingmans Dome Revealed captures the significance of the natural, historical and cultural gem that stands as the highest peak in Great Smoky Mountains National Park. Author Bradley D. Saum offers insight into the wide array of events and history associated with the peak and surrounding slopes. The inaccessible and lesser known aspects of Clingmans Dome in the Smoky Mountains are featured, including the small stone tunnel that sits silently under Clingmans Dome Road, a huge boiler left on the slopes of Clingmans Dome from the logging days, and much more. Each section is illustrated with many photographs that reveal the wide array of historical and present day topics. Clingmans Dome Revealed highlights the fascinating peak that rises above the Southern Appalachians to an elevation of 6,643 feet. Known to the Cherokee as Kuwahi and the early European settlers as Smoky Dome, the story of what is now the most accessible peak in Great Smoky Mountains National Park is revealed. Bradley D. Saum is an author and photographer who currently resides in the Bluegrass Region of central Kentucky, within easy reach of the Smoky Mountains. As a former park ranger with the National Park Service, South Dakota State Parks and Ohio State Parks, Bradley has developed an appreciation for the natural, cultural and historical gems around the country. Bradley is a volunteer alumnus of the Student Conservation Association and also served as an instructor at Glen Helen Outdoor Education Center. A graduate of the University of Dayton, Bradley has a variety of work experiences ranging from wildland firefighting to law enforcement, to senior level management positions with Fortune 500 companies. Originally from Ohio, Bradley has lived in many different areas of the country, and has traveled the United States extensively. The Black Hills and Smoky Mountains remain special places, driving the subjects of his first two books. Bradley has also had the opportunity to travel internationally, visiting fifteen countries across the globe. Highlights include seeing a Bengal tiger in India, walking atop the Great Wall of China, and experiencing and interacting with all the various cultures so uniquely different. Bradley has published several magazine articles and photos, and is also the author of two books: Harney Peak Revealed: A Natural, Historical and Cultural Gem in South Dakota’s Black Hills. Harney Peak Revealed was named a Finalist in the Regional Non-Fiction category of the 2013 Next Generation Indie Book Awards. 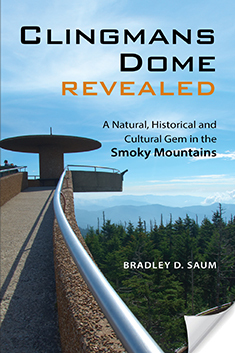 The book can be purchased at Clingmans Dome Revealed: A Natural, Historical and Cultural Gem in the Smoky Mountains . Bradley can be contacted at BradSaum@ClingmansDomeRevealed.com or at www.ClingmansDomeRevealed.com.